From left, Hillsboro City Council members Justin Harsha, Wendy Culbreath, Brandon Leeth and Adam Wilkin discuss business items during council’s monthly meeting Monday at the Highland County Justice Center. Seated at right is Hillsboro Mayor Drew Hastings. 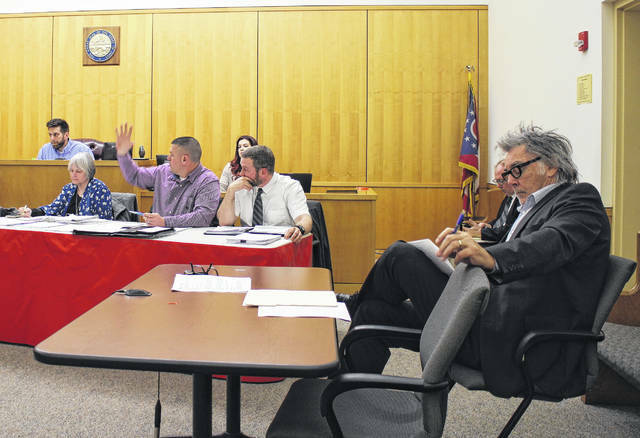 Hillsboro City Council on Monday approved legislation joining Highland County and the Highland County Community Action Organization to apply for grant funding available through the state’s Community Housing Improvement Program. Mark Current, the HCCAO’s housing director, said if the city agreed to partner with his organization and the county, it has a better chance of being awarded $300,000 in funds earmarked for housing rehabilitation and repair in the city. Current, who spoke to the Highland County Board of Commissioners on the same topic recently, said if the grant is awarded, the funds will go to the county and be administered by the HCCAO. According to Current, homeowners and landlords can apply for grant funds if they meet income guidelines outlined by the U.S. Department of Housing and Urban Development. More information on the CHIP grant can be found at hccao.org/housing. Current said Hillsboro Mayor Drew Hastings had asked him to give more frequent reports on the grant, perhaps quarterly. Current said he will compile monthly reports. Council suspended the three-reading rule and approved the resolution as an emergency. In other matters, Hastings reported that a lawsuit filed against the State of Ohio by Hillsboro and several other municipalities was unsuccessful. As previously reported, Hillsboro Law Director Fred Beery told council in February that the city had joined the lawsuit to block the state from processing municipal income tax returns and remitting the revenue back to the municipality. Hastings said the Ohio Municipal League, which filed the suit on behalf of the concerned municipalities, will appeal the case. Hastings also said the city’s community improvement organization, called the Hillsboro Area Economic Development Corporation (HAEDC), met recently and expressed intentions to tackle blight around the city, focusing on smaller properties aside from large-scale projects like the Gross-Feibel property. The city’s Revolving Loan Fund Committee approved a loan for the renovation and creation of the Orpheum Event Center at the city’s old annex building on North High Street, Hastings said. The facility will have more than 6,000 square feet of event space when the project is finished in coming months. Hastings also read aloud a written report from Safety and Service Director Mel McKenzie, who was absent from the meeting due to a family member’s illness. McKenzie said in his report that masonry walls on either side of the empty Colony Theatre lot have been completed and the site will be cleaned up when the weather cooperates. The safety and service director reported that Hillsboro has applied for a grant to revitalize a portion of West South Street, a project that will include improvements to storm drains, curbs, gutters, sidewalks and road work. McKenzie’s report stated that the yearly U.S. Highway 50 Yard Sale will be held May 18-20. Yard sale permits will not be required for those days for any yard sale in the city. For more information or to reserve a spot for the event, contact the city office at 937-393-5219 or the Highland County Visitors Bureau at 937-763-7012. Councilwomen Ann Morris and Claudia Klein, chairs of the Property Maintenance & Restoration Committee and the Community Enhancement Committee, respectively, gave reports to council on a joint meeting the two committees held recently. Morris said plans for the empty Colony lot were discussed at the meeting. Sketches of a decorative facade are to be completed by her committee’s next meeting, and those in attendance brainstormed ideas for a small urban park to fill the space, including seating and lighting. Morris said coordinators may incorporate the theater’s old ticket booth and shadow boxes into the park. The committees also discussed signage for the Hillsboro Dog Park, according to Klein. Klein asked that the topic of entertainment districts be removed from her committee, and Council President Pro Tempore Justin Harsha did so. Hastings said the Hillsboro Planning Commission met March 19 and discussed a civil case filed against the City of Hillsboro in regard to its sidewalk replacement program. The case was dismissed, according to Hastings. The planning commission also discussed the recently drafted zoning code update, the mayor said. Councilman Adam Wilkin, who chairs the Street and Safety Committee, said his committee met in March to discuss a proposed skate park for the city. Wilkin said the committee discussed designs for the park and mulled funding options. Council member and Zoning Committee Chairwoman Wendy Culbreath said her committee also met in March to discuss the city’s zoning code update. The committee will discuss the matter again at a later date. Council heard a first reading on the zoning code update later in the meeting. Council also discussed communication from a local soccer group coordinator regarding scheduling conflicts and public park agreements. • A resolution authorizing the safety and service director to apply for, accept and enter into a Water Pollution Control Loan Fund agreement on behalf of the City of Hillsboro for planning, design and/or construction of wastewater facilities; and designating a dedicated repayment source for the loan. • A resolution to authorize the safety and service director to acquire materials and labor for upgrading the city wastewater treatment plant’s south lift station. • A resolution to increase appropriations in the sewer improvement fund. • A resolution to authorize the lease or purchase of equipment, allowing the city to purchase a new street sweeper. • A resolution to increase appropriations in various funds. Council also heard a second reading on an ordinance to amend the city code to provide for modification of the minimum usage charge for water usage; and a resolution authorizing the safety and service director to apply for, accept and enter into a cooperative agreement between the City of Hillsboro and the Ohio Water Development Authority for construction of catwalks in two city reservoirs. Council also approved liquor permits within the city that were set to expire on June 1, and a resolution to stay until further review an ordinance repealing all previous ordinances regarding the compensation of non-union city employees and establishing new pay schedules.